The heroic frontline German Shepherd came within a whisker of losing his life when he was stabbed protecting his handler PC Dave Wardell. 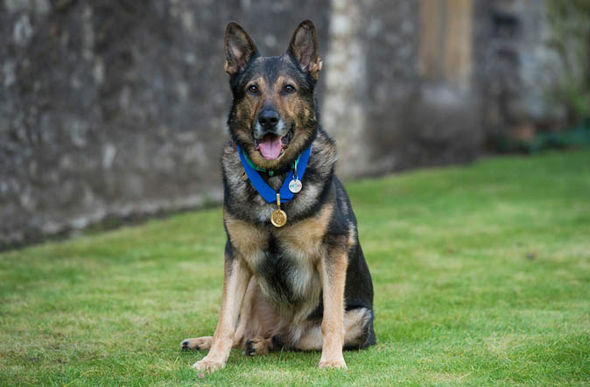 PC Wardell, who was also injured while apprehending an armed suspect, was there to watch when the PDSA’s famous Gold Medal was draped around his faithful partner’s collar today. Finn’s horrific ordeal, which saw him undergoing hours of delicate surgery, has generated calls for new legislation to better protect service dogs from criminals – the so-called Finn’s Law. The award’s announcement comes after Finn recently received the Animal of the Year Award from IFAW in a House of Lords ceremony supported by Express Newspapers. Today PC Wardell saluted his sidekick who has now retired from active duty with Hertfordshire Police but is still a treasured pet. 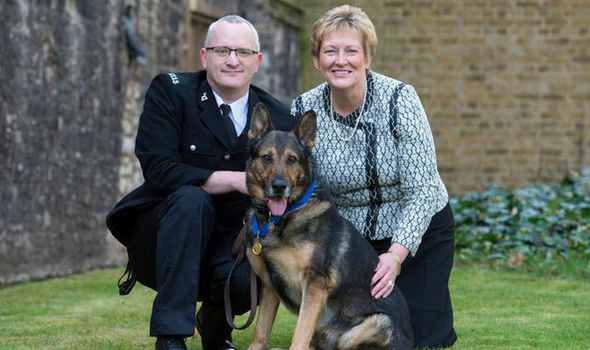 PC Wardell said: “I am bursting with pride that Finn is receiving this award – he is a true gem and embodies everything that is special about police dogs in this country. “He is my best friend and I owe him my life. “Finn’s determination, even after he’d been seriously hurt, was absolutely faultless. “He definitely saved my life that night and stopped an armed criminal from posing a threat to other officers or the public." It was in October 2015 that Finn almost died during a call-out in Stevenage, Hertfordshire, to tackle a suspect armed with a baton or stick. After 11 weeks of veterinary treatment and rehabilitation, Finn was back on active duty and soon making arrests. Finn will be officially presented with his PDSA Gold Medal at the charity’s PetLife ’18 festival at Cheltenham Racecourse – the first ever public presentation of the award – on May 6. PDSA’s Director General, Jan McLoughlin, said today: “Finn displayed outstanding devotion that night, both to his duties and to his handler. 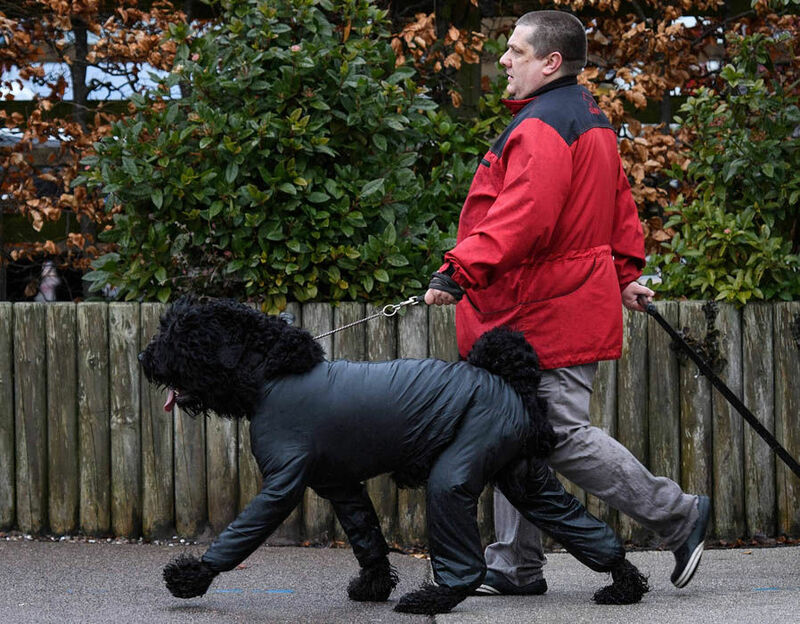 Crufts 2018 in picturesThu, March 8, 2018Crufts 2018: LIVE pictures of the world famous dog show. The PDSA Gold Medal was instituted in 2002 and is awarded to civilian animals for life-saving bravery and exceptional devotion to duty. The medal is now widely recognised as the animals’ George Cross. 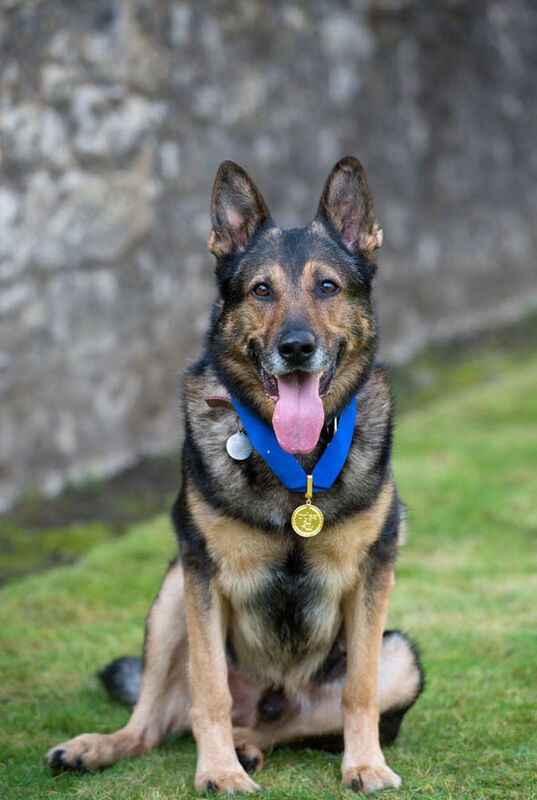 Finn is the 28th recipient of the PDSA Gold Medal, all of whom have been dogs. The charity’s world-renown Animal Awards Programme was set up by its founder, Maria Dickin, with the PDSA Dickin Medal in 1943 for animals in military conflict. It is regarded as the as the animals’ Victoria Cross.